Back in October, we announced that several new capabilities would be coming to Power BI for e-mail subscriptions. 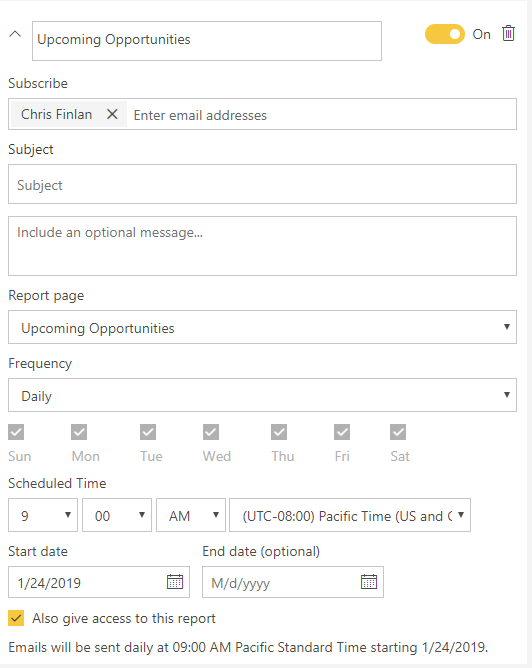 Today, we’re thrilled to announce that one of the most requested subscription features is now available – the ability to set a time-based subscription schedule for your reports and dashboards in Power BI. This new capability is available for all Power BI reports and dashboards, both in Pro and Premium subscriptions. Now, in addition to the option to have the e-mail sent after your initial data refresh occurs, you can setup a subscription to run daily, weekly, or if you’d prefer, only on certain days of the week. And since you can now also pick the time you’d like it to run, you have the flexibility to set it on the schedule you need. Want to refresh your report data at 4 AM and run your e-mail subscription to run at 8 AM each weekday so it’s the first thing you see in your inbox? Now you can! Note: We will be starting to roll out the feature this week. It should be enabled for all users by February 2nd, 2019. To get started, click the “Subscribe” button in the toolbar above your report or dashboard. You can either create a new e-mail subscription, or you can modify one of your existing e-mail subscriptions that was previously created. Don’t worry – existing subscriptions will continue to work as they did previously if you don’t want to change them. If we create a new subscription, we’ll now see by default I am given the ability to create a subscription on a time-based schedule. You have the option to select a Frequency option of either Daily, Weekly, or After Data Refresh (Daily). If you select the “After Data Refresh” option will operate the same way it did previously for e-mail subscriptions, meaning it will only be sent after the first data refresh of your dataset each day. Selecting the daily option will send the mail every day at the time you select, while the weekly option will give you the flexibility to choose specific days. Each user may schedule up to 24 subscriptions per report or dashboard, allowing them to schedule one every hour if they’d like. This could be especially valuable in scenarios where you are using either Direct Query or Live Connection for your underlying data source, or if you have reports and datasets in Premium Capacity and have a refresh schedule that runs hourly as well. One thing to keep in mind – when setting up a subscription to run at a certain time, make sure you aren’t scheduling a data refresh job to run at that same time. This way, you’ll be confident you’ll always see the latest information in the image included in your e-mail that’s sent. Make sure you read the documentation to learn more about these exciting new capabilities, and leave us your feedback in the comments below.